2C-I (2,5-dimethoxy-4-iodophenethylamine is a psychedelic phenethylamine of the 2C family. It was first synthesized by Alexander Shulgin and described in his 1991 book PiHKAL: A Chemical Love Story. The drug is used recreationally for its psychedelic and entactogenic effects and is sometimes confused for the analog 25I-NBOMe, nicknamed "Smiles," in the media. 2C-I is commonly sold in its hydrochloride salt form, which is a fluffy, sparkling-white powder, which can sometimes be pressed into a tablet form. 2C-I has been explored as a potential stimulant nootropic in doses between 1 mg and 8 mg. In the early 2000s, 2C-I was sold in Dutch smart shops after the drug 2C-B was banned. In April 2008, 2C-I was also banned in the Netherlands, along with three other 2C-x phenethylamines previously sold in Dutch smartshops for short periods of time. During the same period, 2C-I also became available in powder form from several online vendors of recreational drugs in the United States, Asia, and Western Europe. 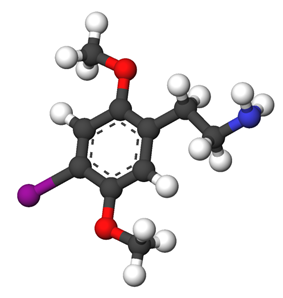 2C-I is often misrepresented as mescaline in US street sale and both chemicals are members of the psychedelic phenethylamine class of drugs, except 2C-I is an analog of mescaline in the 2C-x series. According to the US government's Drug Enforcement Administration, 2C-I is taken orally or snorted in a powder form. The onset of effects occurs between one and two hours when taken orally, and 10–20 minutes when insufflated; lasting between 4 and 12 hours (depending on the dose) though some users have reported a duration of 16–18 hours. Unpleasant physical side-effects including muscle tension, hypertensive crisis, over-stimulation, nausea, vomiting, and seizures have been reported. The incidence of unpleasant side-effects is less commonly reported than with other closely related substituted phenethylamines such as 2C-T-2 and 2C-T-7 which also act as monoamine oxidase inhibitors and may have other action on amine re-uptake. Visual effects of 2C-I exposure have been described by many users as iterating fractals, along with a more generalized shift in perception and/or cognition. 2C-I has been noted by several users to decrease in visual or psychedelic effects with repeated administration, and to increase in symptoms of hypertensive crisis. In December 2003, the European Council issued a binding order compelling all EU member states to ban 2C-I within three months. Sveriges riksdag added 2C-I to schedule I ("substances, plant materials and fungi which normally do not have medical use") as narcotics in Sweden as of Mar 16, 2004, published by Medical Products Agency in their regulation LVFS 2004:3 listed as 4-jodo-2,5-dimetoxifenetylamin (2C-I). Controlled as a Class A substance. In March of 2011 a bill was introduced that would classify 2C-I and many other substances as a schedule I substance. The bill passed the House of Representatives but was not passed by the Senate. As of July 9, 2012, in the United States 2C-I is a Schedule I substance under the Synthetic Drug Abuse Prevention Act of 2012, making possession, distribution and manufacture illegal. ^ "25I-NBOMe (2C-I-NBOMe): Fatalities / Deaths". ^ de Boer; et al. (May–June 1999). "More Data About the New Psychoactive Drug 2C-B" (PDF). Journal of Analytical Toxicology 23 (3): 227–228. ^ Reuters (March 20, 2011). Synthetic drug, subject of proposed bans, kill teen. ^ "H.R. 1254 (112th): Synthetic Drug Control Act of 2011". GovTrack. Retrieved 30 September 2015.